The Adobe Flash platform is bringing stunning new examples of rich media to ecommerce sites. New site design techniques make Flash, Flex, and ActionScript, all from Adobe, very viable choices for adding video, audio, or just plain aesthetic awesomeness to any website’s design. In this article, I highlight 13 examples of terrific Flash usage on ecommerce sites. The folks at Crumpler have used Flash to create a virtual vending machine (the Crumpomatic 3000) that lets shoppers search or browse for products while enjoying what might be one of the most unique ecommerce shopping experiences on the Internet. This site goes beyond just rich media and makes reaching the bar for ecommerce site aesthetics a pole vault. Be sure to check out the various curiosities that surround the main product navigation, but be warned you might hear some strange sounds. If you get lost, use the “menu” in the upper left. The Affair has put its back into ecommerce site design. This Flash site loads with a collection of t-shirt models standing with their backs to the shopper. Hover over one of the model images and the Flash spins it. Click and the image increases in size while the balance of the product detail page appears. Shoppers can also spin the models 360 degrees. This is very cool product navigation. 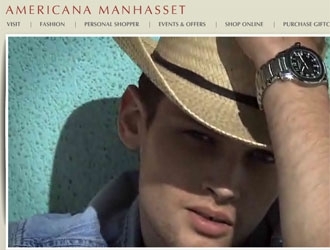 Fashion retailer Americana Manhasset makes fantastic use of rich media on its stunning ecommerce site. I particularly like the professional videos that quickly load when you arrive at the site’s main page, and the completely Flash-based product detail pages that represent a major, site-wide commitment to rich media. The site runs on Create The Group’s CTS/Sell platform. You might pronounce Moofe like “movie,” which would be just fine considering that this store sells downloadable backdrops for filmmakers working with computer generated imagery, also known as CGI. This Flash site typifies why Flash is so popular with web designers, giving users big, beautiful imagery and great navigation. When you’re done checking out the Flash, see if you recognize any of the backdrops from commercials or videos you’ve seen. If the Converse website is any indicator, the maker of denim high-top shoes has come a long way in hip fashion. This site is almost completely Flash from the home page merchandising to the embedded video to the amazing product detail pages. Its design is attractive, impressive, and very functional. The Converse site is yet another example of how great Flash design can support a company’s overall brand strategy. With a cartoon images and animal sounds, Loworks Store makes extensive use of Flash to build a shopping environment that reflects the Japanese design company’s pop culture brand. The site is not as dramatic as some other Flash-based websites, but I believe it is a good example of Flash’s flexibility. The UNIQLO site features a very cool Flash-based product explorer that allows customers to filter, save, and resize a product display, accompanied by a collection of motions and sounds, that makes the site fun to interact with. UNIQLO also uses Flash video to promote featured products on the home page. This is a great ecommerce site. The Kobalt Design Shop displays many of its products right on the home page, augmenting the images with Flash-generated sound and motion. The site’s product pages fly in with ease. And all of the navigation reacts to the visitor’s mouse. To me, the site was indicative of the Japanese culture it comes from. Qbic takes a relatively long time to load and requires a demonstration movie to explain the complex navigation—indicating that in some ways the Qbic Flash website is ahead of its time. But if you want to see what ecommerce can be like when bandwidth and human-machine interfaces catch up to Flash development, Qbic is just the site to visit. Many of the Flash sites I’ve described in this article push the proverbial envelop in terms of navigation and style. But Storyville Coffee, which has had a mostly Flash site since 2006, embraces more mainstream site layout, but enhances what could be a common layout with exceptional imagery and interaction. The site uses Flash to accent the familiar with superb images and rich sounds. This ecommerce site is a class act. I could almost smell the coffee—maybe that’s why this is one of my favorite ecommerce sites. Utah-based Creative Advertising USA has a cool, Flex application called Creative Canvas on its site that allows customers to create custom shirt designs. Customers can upload their own images or use the Creative Canvas’ clip art, lettering, and shapes. The drag and drop interactivity found in Creative Canvas is possible with other technologies (most notably AJAX), but where those technologies and techniques are now, Flex really does it best. Flash powers Tower9 Inc.’s home page, category pages, and product detail pages for a top-to-bottom rich-media ecommerce experience. The site uses Flash and ActionScript 3.0 on Level Four Storefront’s platform. In many ways, the site layout is not too different from other similar ecommerce stores, but the Flash gives the site an edge in professionalism and interactivity. Björn Borg has been using Flash on its ecommerce sites since 2007, perhaps making the company a pioneer in combining a completely rich media website and ecommerce. Products appear in a grid and the home page merchandising uses embedded Flash, to achieve more motion than your average ecommerce site.